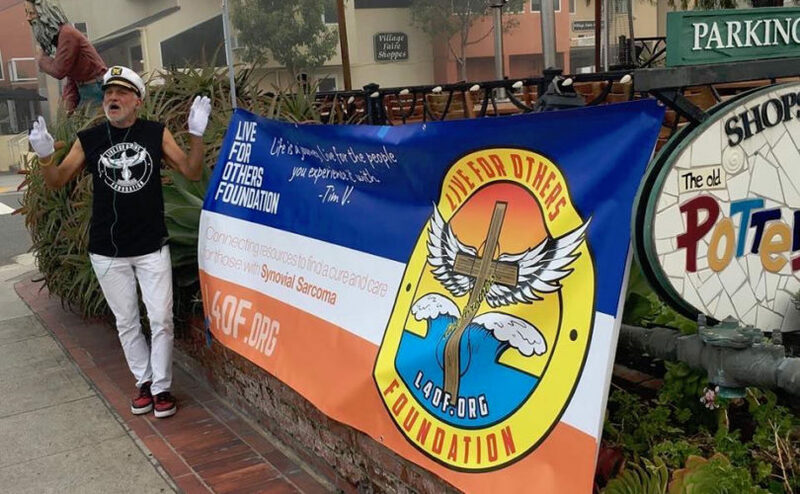 Michael Minutoli, Laguna’s Greeter, raised $2,347 over the weekend during his 24-hour Greet-A-Thon fundraiser in memory of Timothy Vorenkamp, a young man who passed away from a rare cancer, synovial cell carcinoma, two years ago at the young age of 18. Before he passed away, Tim had already generated $50,000 for Make A Wish and his own Live for Others Foundation, founded to fund cancer research, particularly into his rare form of the disease. One item on his final wish list was to have lunch with Michael, the Greeter, because he wanted to know “what made him tick” and admired his positive, optimistic spirit. Unfortunately, that meeting was never to be. But hearing of Tim’s wish, Michael was determined to do something practical to honor Tim’s memory – thus the Greet-A-Thon. In the first year, Michael raised $1,100; last year, he raised $1,400 – and now that figure is almost $1,000 higher. Petra Vorenkamp, Tim’s mother, noted on social media what a blessing it was that Michael, a man without a bed or a home, was willing to give up 24 hours to help her son’s dream come true. People can continue to donate through the Live For Others Foundation website at https://l4of.org. The Live For Others Foundation (L4OF) is dedicated to finding a cure for synovial sarcoma, a very rare form of soft-tissue cancer diagnosed primarily in teenagers and young adults. The Foundation also has a project called “Tim’s Room”, which aims to help families create loving and comfortable spaces within their homes for their young adults needing hospice and palliative care support, like Tim had in his Oak Street home. The foundation provides design and resources that will maximize comfort, quality of life, clinical care and family interaction during this crucial stage of the journey.